There are just too many cellar doors in Australia to visit them all even if you averaged one a day it would take you a few years it would take you a few years to get around them all. So you need to get more efficient. One way is to let the winemakers come to you and that’s what these events are all about. Problem is they are all on the same weekend. I have visited this event twice before, and I will be going again this year. This is a well organised event, there is plenty of space and it doesn’t get too crowded. If you are going then come and have a chat. I won’t have a stand but I will be wandering around on all three days. This is a virtual event. Most wine drinkers have a few bottles in their cellars or at the back of the wardrobe that they are keeping for a special occasion. You keep putting off drinking that wine because you want to keep it fro a special occasion. The problem is that the special occasion never seems too come around, and after a decade or so the wine has become expensive vinegar. Open that Bottle night was created at the turn of the century by New York wine columnists Dorothy J. Gaiter and John Brecher. They set the date to brighten up the deep and dark February in New York. But you can do it wherever you are in the world. Actually you can do it on any night of the year, and this year you have 366 opportunities. Invite a few friends. Make sure you have some younger wine in reserve, just in case. There will corks, some in not so good condition, so make sure you have a couple good corkscrews and some equipment for decanting and perhaps straining out cork fragments. If at first tasting the wine is not attractive, leave it an hour or two to exhale some of the nasty odours then try again. So what are you waiting for? Draw up a guest list and start planning your own OTBN party. 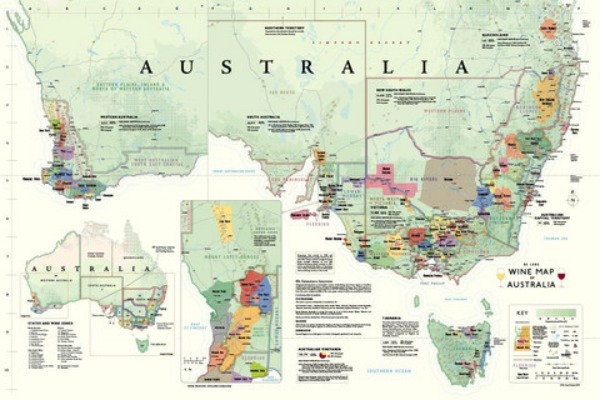 I now have a full complement of De Long’s Wine Maps in stock including the new map of Australian Wine regions and one for the Pacific Northwest of United States overlapping into the province of British Columbia in Canada. For those of you with iPhones and iPads I am publishing the third issue of my EST Wine Guide at the end of January. You can subscribe to the magazine for free and you'll get a reminder on your device when it is published. Do a friend a favour and forward this newsletter on to them. It will be doing me a favour too.